If my daughter ran the world, it would be a much simpler place. “Why do people have different languages in other countries?” she asks as we drive past French roadside hoardings. 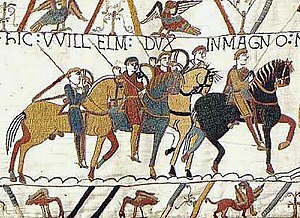 I try to think of a few French words that migrated into English after the Norman Conquest. Oh, “language” – that will be one of them (as in la langue Francaise) – and “conquest” (la conquete). She doesn’t look convinced (or even convaincu). Her skepticism is catching and I find myself looking out for bizarre examples of this alien lingo. As we cycle round the city walls of Montreuil, I espy a poster advertising an event. In large type, the name “BIGOT” stands out. Riding shotgun after Laura, I don’t have time to check the details, but I am disappointed to realise that it can’t be a political poster. It lacks the dreadful photo that seems indispensible in mainland European electioneering. I’m always astonished that any politician is elected on the basis of these huge, insipid mugshots. They’re usually posed against a bland studio backdrop, showing over-groomed and coiffed men and women smiling straight at the camera. All the politicians look phoney. This approach certainly wouldn’t work in Britain, where most MPs are elected in spite of their hairstyles rather than because of them. I’m amazed that it works abroad. Food advertising here seems to follow the same pattern. We pass a giant poster displaying nothing but a tin of sweetcorn, the face of a woman looking vaguely startled, and the price. It does not for a moment make me want to buy a tin of sweetcorn. Yet presumably to the French shopper it is persuasive, as there are similar advertisements everywhere we go. Driving in the camper van later that afternoon, we pass a shop under the name of “COFFIN”. I’m not sure I’d want to take advantage of the sign inviting me to fill my house with its products – until I realise that it’s not an undertakers, but a furniture store. Soon afterwards, our van’s cooking gas cylinder runs out. Seeking a replacement, we spot one marked “MALICE” on the service station forecourt. I do a double take. Is this a special brand aimed at the terrorist market? “Malice – le gaz ideal pour ceux qui preparent les bombes chez eux”? Might be hard to get that one through customs on the way home. (We settle instead for “Le Cube” – a square brand of cylinders, which seems rather a contradiction in terms). Later, searching in one of the van’s cupboards for a spanner, I rediscover a handy translating gadget that Gordon has tucked away and forgotten about. Laura is intrigued by the concept and he shows her how it works. You input a word in one language and choose the language into which you’d like it translated. Et voila! But for Laura, two languages are not enough. She inputs her own name in English, then translates it into another language, then translates the translation into a third language, and so on until she runs out of languages. Eventually it emerges in German as “Kopfsalat” – which I am pretty sure means “lettuce” (literally “head salad”). We are all quite tickled by this Chinese Whispers effect, and she spends much of the rest of the day speaking aloud in a language she has made up all by herself.